It began with thunder, unlike any thunder I had ever heard before, not like the sound that occasionally follows a lightning strike, but instead a constant and consistent booming thunder getting closer and closer until the sound seemed like it was across the skies from horizon to horizon. I monitored, on a computer, a storm chaser's vehicle position as he drove several times past the end of the dirt road that leads to the ranch. A storm chaser's vehicle location is usually a good indication of where the bad stuff is, or is going to be. If they are in the area, and the sky is getting dark, it's time to get concerned. In the background, the local news networks on the television were already describing tornadoes on the ground and heading in our direction. 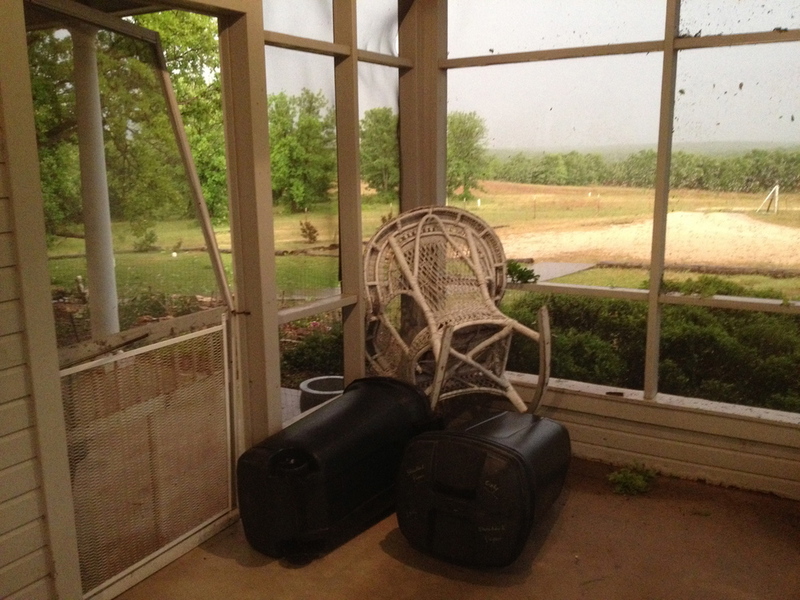 The skies continued to constantly complain, as I looked through the screen on the screened-in porch at what might be a tornado in the far distance. I walked back inside and began thinking about where in this house of many windows should I position myself. I chose the downstairs bathroom. I spent a total of about 30 minutes on the evening of May 15th, 2013, huddled in a bathroom waiting on a tornado to pass. I watched the storm tracks on the laptop via the Internet and read the special weather statements on my smartphone as app after app sounded warnings. Then it happened. 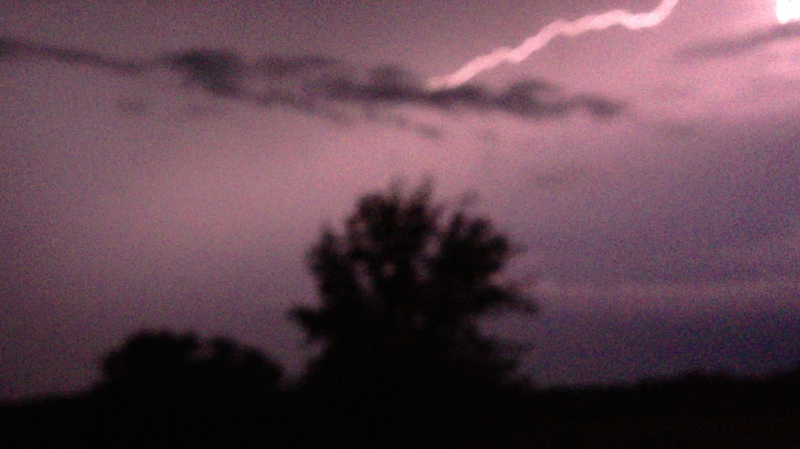 The sound of the twister moving through was much like the sound of heavy roaring hail upon a roof. I then heard what I thought was the screech of sheet metal being peeled off the roof by the high winds. Oddly, in that moment I really didn't feel fear. I remember thinking, "Oh, well, if this is it, this is it." But, thankfully, it wasn't. I've heard of the fog of war, but never really felt it until then. I had no idea what might be outside that bathroom door. As I left my small space, the fog first began to lift. The winds were still howling; the rain still falling at angles that seemed strange to me. I walked into the living room and looked up the staircase and the second story was still intact. As the rains let up, I began to see the damage. Tree limbs and leaves were everywhere. 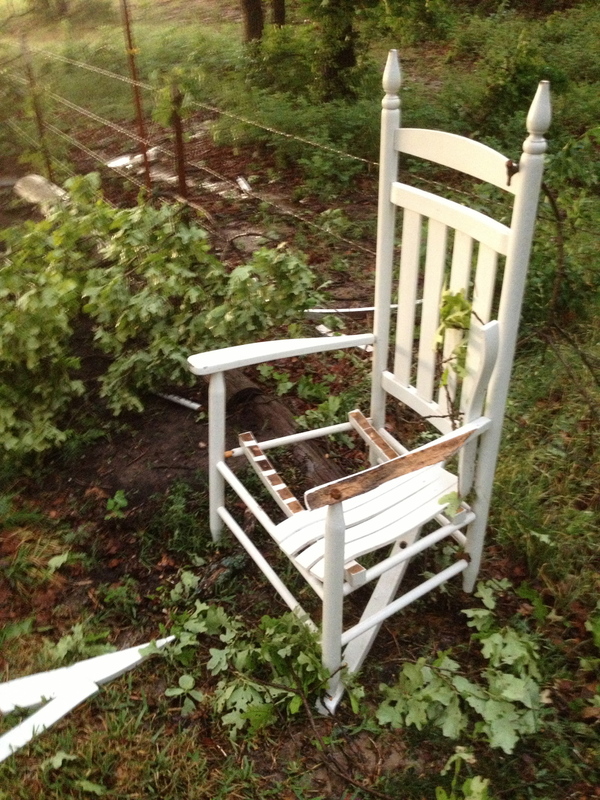 A wooden rocking chair that was on the front porch had been sucked out and now sat in pieces against a barbed-wire fence some hundred feet away. Another chair and a bench beside it had been untouched. The screen on the screened-in porch, where I had been standing earlier, had tears in it and a wicker rocking chair had been tossed into one corner. Other items were pushed up against the chair. The screen door had been broken in half. After the lightning and thunder had died down a bit and the rains let up, I was able to see that high winds had brought down a lot of large tree limbs and chopped off the tops of several oak trees around the house. Leaves were scattered throughout the yard. The roof was still intact but a piece of trim on the upstairs window was missing. It must have been the chair I had heard sliding across the concrete outside that sounded like the roof coming off, or it might have been a missing piece of the gutter that still has not been found. The house suffered little other damage. I ventured farther out and found the cast-iron barbecue pit turned over in the driveway, some ten feet from where it had stood in the carport before the storm. 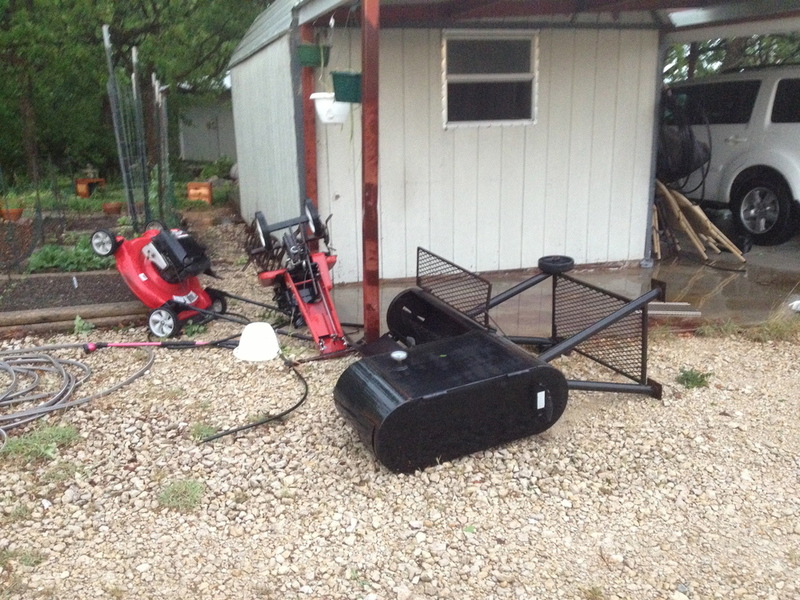 Alongside the overturned barbecue pit, a tiller and push lawnmower were turned upside down and leaking gas. Parts were broken on both of them. Barrels were cast this way and that, and their lids were found over a hundred yards away. One lid is still missing. The satellite channels were off-line because the dish had moved, but there appeared to be little damage to it. Rolled roofing had been ripped off the roof of the well house. The trees actually appeared to have buffered the winds and protected the house. It was the trees that had suffered the most damage. I decided the following morning to lift the fog a little more by venturing out to see if I could follow the path of the tornado across the ranch. Using my smartphone, I took a lot of pictures of the damaged trees, then used the info button inside an app to see a map of the location of the images. With this, I could see the path the tornado had taken across the ranch. The tornado made a lengthwise trek across the ranch from the northwest to the southeast borders. The house was on the edge of a direct hit from a debris path that stretched at times over a hundred yards across. The more I stared at the map, the luckier I felt...and to think, this was probably a small tornado. It was nothing like the ones to the south, where homes were destroyed and lives taken. In moments like this, I know I should feel thankful to be alive. Tornadoes are like that; they can put hay straws through telephone poles, damage some homes in their paths and leave others completely untouched. As a child, I watched from the backseat of a car as a tornado raged across a field, lifted up over our car, and then touched down on the other side. Take whatever you want from that; I just counted it as being lucky at that time. As I wrote about the coyote encounter last week, I could not have imagined an encounter with a tornado the following one. So...maybe it is time to count my blessings.